Mingo Gallery is proud to host local artist Andrew Houle. In Plain Sight is a collection of new works in oil on panel depicting some of the North Shore’s most beloved and iconic scenes. Beverly’s recently closed Bowl-O-Mat, along with the always active graffiti “Free Wall” are depicted here. The infamous Pink House located on Plum Island, Annisquam’s Hodgkin’s Cove, and the old paint factory in Gloucester are represented as well. Each with a nod to their history and significance to their surrounding communities, but also in a stillness that represents both their natural beauty and (in some instances) their sad demise. Tapping his background in illustration along with a love of neon lights and the aura of twilight, Andrew imbues his photorealistic paintings with the romantic haze of nostalgia and fragility without being overly sentimental. Andrew’s choice in scenery is modest and seeks to fortify credence for the working class home, neighborhood corner store or the little blue collar sneak peek of oceanfront. Now, more than ever, time feels like an abstract concept that we struggle to reconcile and with it our landscape and surroundings seem to change at rates we can’t keep up with. Andrew takes great time to painstakingly immortalize the overlooked bits in the fabric of our environment, often focusing on the most vulnerable or fleeting, to make sure we don’t entirely lose it all or forget what once was. Andrew is a graduate of Montserrat College of Art with a concentration in Illustration. He has a studio located in Beverly’s Portmill Studios, and is one of the minds responsible for producing Beverly’s Comic-Con as well as Chroma, a four volume series that chronicles contemporary artists working in a variety of mediums. He lives and works in Beverly with his wife Melissa and daughter Elaina. He serves on the Beverly Cultural Council and he’s also the guy that ruined last Christmas with the Batman banners all over downtown. 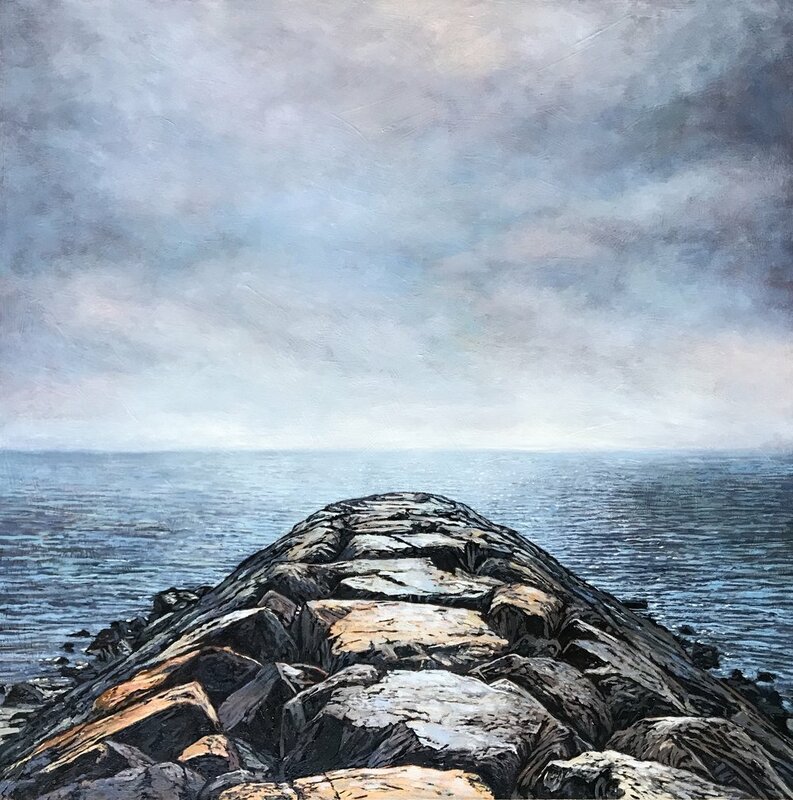 Andrew has exhibited his work throughout New England and his work can be found in private collections internationally. Mingo Gallery and Custom Framing, offering quality custom framing and exhibiting contemporary fine art. See examples of our custom framing and find out what's currently on view in the gallery.